Can Dental Implants in Allentown Replace My Missing Teeth? Are you among the 178 million adults in the United States missing at least one tooth? If so, you probably feel insecure about your incomplete smile while also struggling with simple tasks like eating and speaking. Although you would like to fill the space, you are not sure what options are available to you. You could choose a traditional method like a dental bridge or dentures but do not want to deal with their disadvantages. Now, you can replace your missing teeth permanently with dental implants in Allentown. As the most preferred and successful option, you will invest in your confidence and quality of life by completing your smile with Dr. S. John Salivonchik. 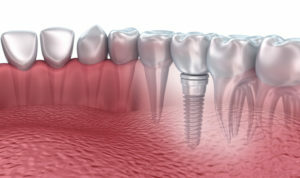 Dental implants are composed of three main parts: an implant post, an abutment, and a dental crown. Together, they replace both the root and crown of the tooth. The biocompatible post is surgically placed into the jawbone, which anchors the prosthetic in place. The jawbone fuses to the material, allowing it to last a lifetime while providing a sturdy and secure foundation for the crown. An abutment is attached to the post to connect the custom-made restoration to it. With all three pieces in place, you benefit from the only prosthetic that most closely looks and functions like a natural tooth. In fact, when compared to traditional dentures, you gain an increased biting force of over 70%. Overall, dental implants are convenient because you care for them as you do your natural teeth. You do not need special cleaning solutions or adhesives while enjoying the ability to eat and speak without slipping or discomfort. They can be used to treat all cases of tooth loss, no matter if you are missing one tooth or an entire arch. This provides the perfect alternative to a traditional bridge and crowns, partial dentures, or complete dentures. To invest in your confidence and quality of life, you need to schedule a consultation with your dentist in Allentown. Dr. Salivonchik will evaluate your tooth loss and oral health to ensure you are a candidate. In addition to healthy gums and adequate bone density, you must also have minimal risk factors for implant failure. You cannot have any medical conditions or lifestyle habits that increase the likeliness for infection or lower the body’s ability to heal. If you are ready to see if you are a candidate for the procedure, it is time to call our office to schedule your consultation. Dr. Salivonchik will discuss your options to help you regain a complete, confident smile. Comments Off on Can Dental Implants in Allentown Replace My Missing Teeth?